Introduction: Gold has been in the news of late for a number of reasons, including the recent steep rise in prices. It has been a currency and a store of value for man since centuries. In the year 1971 a certain US president freed the US dollar from the Gold standard. Today 40 years on, the USD has fallen considerably in value, and leaders in the US have come full circle, and are mulling a return to this standard. Other minor uses like in electronics, computers, dental, idols, etc. 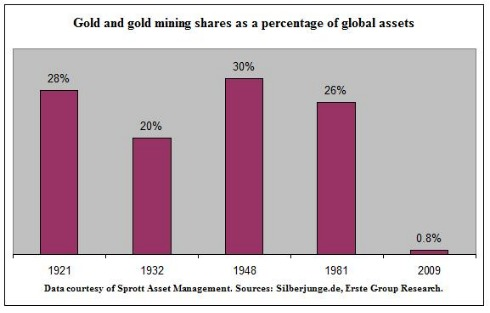 Some Perspectives: The fig 1 graph below shows that Gold has been ignored as a store of value in recent decades. The US government has taken on too much debt to fund their domestic and international spending. The economy has been downgraded by S&P for this, and the USD is no longer a safe store of value. Unless the US debt situation recovers – unlikely given their monetary policy – gold will continue to be safe haven for governments in their Forex baskets. The European Union is also facing challenges due to economic slowdown and the inability of member countries to control government spending. Individuals from India & China continue to buy gold. High inflation means that cash is losing value. Higher affluence means more spending in gifts and jewellery. Indian marriages will always need gold, right? The trend, as we can see, is that Gold is appreciating. The main question is, till when? The answer I feel is linked to the events in the two key developed regions of the global economy. Gold will appreciate for the next 1-2 years, until the above economic problems at least appear to be receding. 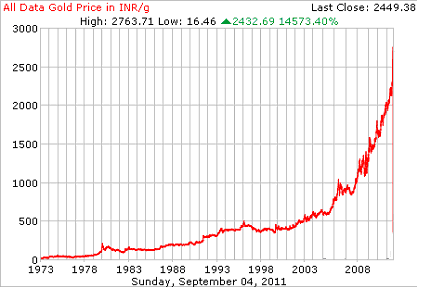 Gold price rise will gather momentum, till it ends with a sharp rapid peak. Investors are advised to invest with a 1-2 year perspective. Gold, unlike stocks is only a store of value. It does not give dividends. The investment in gold is not productively utilized. The price of Gold has appreciated rapidly in the recent past. The peak followed by a change of direction can be rapid, and the fall very steep. Investors need to track headlines and prices and make an informed exit call. It is really interesting article but still substantial information is not covered as what would happen to Gold vis a vis other commodities, particularly food products. There are many commodities; I feel that for eg. Food products may be unrelated to Gold, and so do not want to discuss this in this article.